Showing results for tags 'membership'. We offer 4 different ways for professional appliance techs to participate in the Appliantology tech community. Three of the memberships are premium, and one is limited. The features and benefits of each option are summarized in the table below: Click the links below for details: 1. Professional Appliantologist: the easy, instant premium membership for less than $4 per week. 2. Fellow Appliantologist: this free premium membership is earned by being an active participant in the Appliantology brotherhood. 3. MST Alumni: this free premium membership is earned by getting certified in the Fundamentals of Appliance Repair course. 4. MST Student: this free premium membership lasts for 6 months and is included with enrollment in any of our technical courses at Master Samurai Tech. 5. 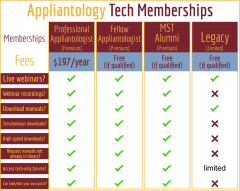 Legacy Tech: this free limited membership is for professional techs who want to check out the Appliantology community and hopefully like what they see enough to either earn or purchase a premium membership. Aside from the benefits listed above, every Appliantology tech membership ensures two things that very few other sites out there do: no ads and no data harvesting. We strive to provide our members with an uncluttered, ad-free experience, and during your stay at the Appliantology forums, absolutely none of the content you create or your personal data is collected for our own or any other company's purposes. This short little screencast by @Son of Samurai shows you how to renew your Professional Appliantologist membership at Appliantology.org so you can continue to enjoy the many benefits the site provides to professional appliance repair technicians. Appliantology: GOOD News and BETTER News! Well, mah breverens, I have GOOD news and I have BETTER news! First, the GOOD news: Appliantology will continue to be here as the web’s premiere appliance tech support community for the foreseeable future! Also, our increased focus on professional tech support (rather than DIYers) over the last couple of years has transformed the site into a strong community of techs with a vastly improved quality of posts and tech resources. Now, the BETTER news: The membership fee for a Professional Appliantologist membership is going up by ONLY $3.34/month! I know, crazy, right? In spite of all the enhancements and improvements to the site and our increased costs of keeping the lights on here at Appliantology, we crunched the numbers and we only have to increase our Professional Appliantologist fees by a measly three-something bucks per month. Phew! We were worried it would have to be higher. But NO! Those of you who’ve been around for awhile know that we’ve really upped our game over the years, going from a very low overhead part-time pastime to a robust site on a dedicated server with an IT guy to make sure we are a fast and reliable resource for your business or career. Plus we’ve added regular live webinar events that have become a popular feature for many techs. Here’s a recap of all the fantastic features and benefits available to Professional Appliantologists: All-star access to the Techs-only forums UNLIMITED service manual downloads! If a tech doc you need isn't already in the Downloads section of the site, you can request one and we'll get it for you Free admission to the Samurai's live tech training webinars Free access to webinar recordings Free access to Samurai's Video Classroom Free access to the Appliantology chat room For most of Appliantology’s long and storied history, the membership fees didn’t accurately reflect the true cost of running the site because the site also generated significant income from Google ads and parts sales to DIYers. But both of these income streams continue to dwindle, so we are going to be increasing the membership fees in February from the current $109/year to $149/year (only $12.42 per month, paid annually). But wait! Incredibly, there’s MORE GOOD NEWS: I’m announcing this now so existing members can have the option to extend their current membership another year at the existing rates. New members who subscribe before the fee increase will also get the existing rate. The Professional Appliantologist membership fee increase occurs on February 15, 2016. So if you’re considering getting a Professional Appliantologist membership for the first time or renewing your existing membership, NOW IS THE TIME TO ACT! P.S. I know you’re going to be shocked--SHOCKED!-- to find out that whenever I have to increase prices, I get a few complaints. I have to say it always surprises me, since most of us understand that the costs of running a business go up over time, and we just have to adjust our pricing accordingly. Let’s see - an extra $3.34/month means you may have to charge your customers about 4 cents extra per service call. I think your business will survive.